Instagram turns 15 years old in 2020. So to be frank, if your campground is still not using it, you really have no excuse. Nearly 1 BILLION people use Instagram every month and of those 1 billion, 500 million use it daily. Over the last 10 years, Instagram has become become a digital link between celebrities, politicians, artists and legions of followers and fans. But most importantly, Instagram has evolved into a marketer’s Nirvana. Owned by Facebook, it is easy to run ads to reach EXACTLY the perfect camper you want at your campground. Now some of you might be saying, what does Instagram have to do with the fixing pipes, stocking pantries, and making sure that the Smiths, regulars at your park for the last fifteen seasons, get that cabin they like so much? If you ran a string of coffee shops it would make sense…but you don’t. Your target demographic skews older and has a rural rather than metropolitan sensibility, quite different from those Millennials you hear about. More importantly, your business delivers a service, not a product. You can’t capture the feeling of giving someone a taste of nature or a home-away-from-home with a quick photo and a hashtag. You’re quite right in thinking that a campground is a fundamentally different beast than most businesses. But it’s a business nonetheless, and one can never have too many customers or too loyal customers. 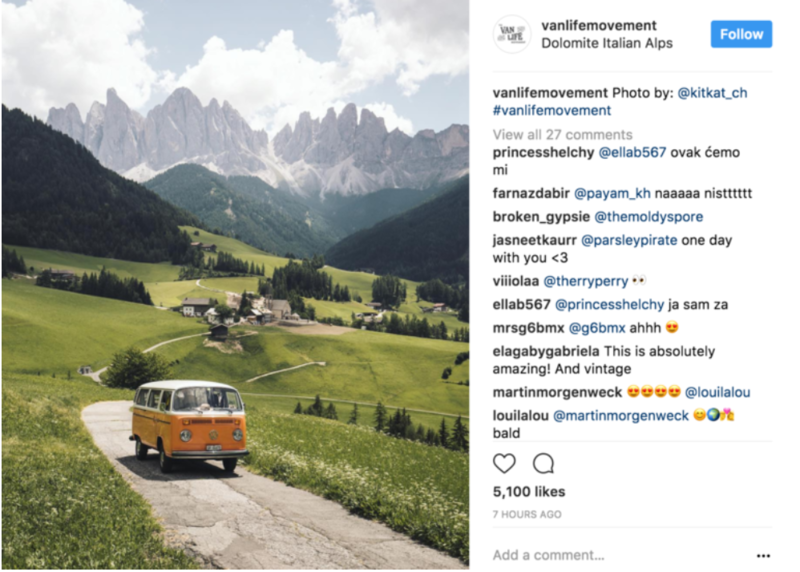 Instagram provides a medium that has the power to vastly increase a campground’s new customers, and ensure that current customers return every season for years to come. First, Instagram offers free access to many (several million) potential customers. A campground owner with Instagram has a level of advertising power at his fingertips that, fifteen years ago, was available to only the largest corporations. Furthermore, the majority of Instagram users are millennials. A highly urbanized generation, studies have shown that many today’s youth and young adults are increasingly interested in connecting with nature. They have a rising level of disposable income, and prefer bare bones, “back-to-the-basics” experience to the highly amenitized consumption of their parents. These traits make them ideal campground patrons, ones that could replace today’s older campers in the next ten to fifteen years. Instagram would be an easy, cost-effective way to reach out to this increasingly important demographic. Second, though campground success is primarily driven by quality service, few would argue that having a striking natural environment is also important. Experiencing nature is inherently a visual experience and Instagram, driven by pictures, would complement this nicely. As wonderful as word-of-mouth reviews about your service may be, many, many potential campers will find a well-edited picture of your property a more compelling draw. Instagram is also going to be rolling out geography-targeting features in the near future. A campground owner like yourself will be able to send curated pictures to Instagram users nearby. Third, and finally, Instagram provides a wonderful way to remain connected with past or ongoing customers. Just ask your customers to follow you to stay connected and instantly, you will have access to their feeds to remind them how much they want to come back. Now that you know WHY, let’s talk about HOW. After setting up your park, make sure you use the perfect hashtags to expand your audience base. Don’t know what to use? Simple type in #[yourstate]state #camping #rv into THIS SIMULATOR. It will then give you exactly the right hashtags to use. If you want to reach even more potential customers, we would suggest running instagram ads. One of the best ways to boost posts are to those traveling within your state who have an interest in camping or RVing. Not sure how to do this? CLICK HERE to our Marketing 101 e-book which covers how to place Facebook and Instagram ads to gain more customers. We hope you learned a little about Instagram and are as excited as we are to use this platform to expand your customer base. If you have any questions for us on Instagram or Bonfire shoot us a email at howdy@letsbonfire.com.